Hall of the Mountain King: Still Spinning: Anthrax, "We've Come for You All"
As I await the release of Anthrax’s Worship Music, the band’s reunion with 1980s singer Joey Belladonna, I’ll try to drown out the soap-opera drama with changing lineups and re-records surrounding it by cranking up their last record — and one of their best — 2003’s We’ve Come for You All. Don’t get me wrong. I grew up on the 1980s version of Anthrax with Belladonna, and I still love it. But when he exited, and they tapped Armored Saint singer John Bush, the band became something different, and while I know a lot of fans will disagree with me, something better, in my opinion. The Belladonna era of the band was perfect for my teenage years. It was fast, brash and a little cartoonish and goofy. The band with Bush, though, was Anthrax for my adulthood. It was a little slower, a little heavier and a lot more thoughtful. Plus, Bush is just an all-around better singer to my ears. There’s more soul and a greater range of emotion in his voice, and if I’m being honest, I actually preferred Bush’s version of a lot of the Belladonna songs. 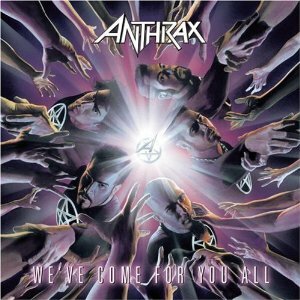 We’ve Come for You All was recorded coming out of Sept. 11, which wasn’t a particularly good time for Anthrax for a couple of reasons. First, they’re New Yorkers, and second, in the wake of the attacks, the world was reintroduced to anthrax the disease, which had been pretty much forgotten when Scott Ian named his band in the early ’80s. Things got so grim for a time that the band actually considered changing its name. Ian joked about calling it Basket Full of Puppies. Shortly thereafter, Anthrax appeared on stage wearing matching white jumpsuits that spelled out “We are not changing our name.” There seemed to be a new unity and solidarity in the band and on the record. This album was a response to the dark days after Sept. 11 — a fierce response, an exciting response. I thought at the time that it was surely the beginning of a new era for Anthrax. I had no idea that it was actually the end of one. There’s really no other place to start looking at We’ve Come for You All than with the single “Safe Home,” essentially a love song written to New York. It’s a little different from most Anthrax fare. A little more radio friendly than usual, perhaps a little more heartfelt. It’s commercial tenor — and the video that starred Keanu Reeves — aside, it’s a tune that worms its way into your head and won’t let go. It’s a great hard rock song. Of course, we’re talking one of the big four of thrash here, so there’s plenty of heavier fare. The other single from the record “What Doesn’t Die,” definitely offset the commercialness of “Safe Home.” It’s a pounding, full-speed thrasher complete with a zombie video (though, I guess the same argument could be made for that “Safe Home” video now that I think about it.) The slamming thrash drops down into a very memorable chorus and a nice melodic interlude about halfway through — a hallmark of the Bush days. There are a couple of other really fast numbers here — “Nobody Knows Anything” is a great catchy song, “Black Dahlia” gets a little too caught up in being heavy and forgets to be memorable — but where the Bush lineup of the band shined was on mid-tempo tunes. That’s also where this record shines. I’ll start with probably my favorite track, “Cadillac Rock Box.” It had a guest shot from Pantera guitarist “Dimebag” Darrell Abbott (who also guested on the band’s 1998 record Vol. 8: The Threat is Real along with singer Phil Anselmo). The song opens with an answering machine recording of Dime doing his trademark “whoosh” sound at the end — something that’s endeared the song to me further since he was murdered on stage in 2004. After that it blasts into a grooving slab of hard rock where Dime’s guitar does the talking. It’s a good time waiting to happen. It’s one of those songs that just makes me a little happier when I crank it up loud. Dime’s not the only guest here, though, and not the biggest name, either. The Who’s Roger Daltrey shows up on “Taking the Music Back,” but is sadly underutilized on one of the albums’ weakest tracks. But the misses are few, far-between and soon forgotten about when you’re rocking along with another favorite of mine, the good-time, old school hard rocker “Strap It On.” There’s “Superhero” that gives Bush a dark, almost alternative moment on the verse, then blows up into a metallic screamer on the chorus. There’s the plodding strength and cool of “Refuse to be Denied.” Almost every song on the record is killer, and at the time it came out, that was a rare thing in the metal world. Which brings us to the sad part of the review: the could have been. We’ve Come for You All, in my estimation, is easily the equal, if not the better, of anything from the Belladonna era — even fan favorite Among the Living. It excited me like no Anthrax record had in a long time. But after the release of the album, Ian and Co. invited Belladonna back into the fold to cash in on the reunion rage of the time. Bush went home to be with his family, do voiceovers for Burger King commercials and, eventually, record a new album with Armored Saint, 2010’s La Raza. Anthrax hired a new singer, Dan Nelson, and recorded the first version of Worship Music, which was shelved when the new Nelson left or was fired — depending on whose story you believe. Bush was invited back and did a few festival shows with the band, but left again when they had creative differences over re-recording Worship Music. Belladonna stepped back into the gap, re-recorded the album, and it will finally see the light later this month. Anthrax has tried to draw an obvious parallel between Worship Music and We’ve Come for You All. The album covers are incredibly similar, and from the two songs and brief sound clips I’ve heard, so is the music. It sounds good, but is it too late to give fans the follow-up they deserved years ago, and will either faction of fans be pleased by Belladonna singing over the Bush-era sound? I hope I love the record, and I hope it does well for them, but I just have to believe that every time I listen to it, I’ll wonder how much better it could have been.